Basement drains have many different names, including drain tile, weeping tile, French drain, interior footing drain, and other names. They also come in many shapes and sizes, some which work better than others. Want your basement dry all the time? An inside perimeter drainage system of your basement will take care of that. Installing a basement drain inside your home, a contractor will run a drainage system across all leaking walls and ideally along the entire perimeter of the basement or crawl space. A sump pump will discharge the water out and away from the house, once the water is accumulated. With any product, some will work much better than others, and the same can be said with basement drains. There will be some basement drains that will perform better than other ones. B.Q. Basement Systems would like to share with you some of the features of the best basement drains -- and why our system is the one for you. If you're interested in more information, B.Q. Basement Systems is ready to help you. We offer free basement waterproofing quotes to homeowners throughout Eastern PA & Western NJ. Our service area includes Pottstown, Trenton, Levittown, and many areas nearby. 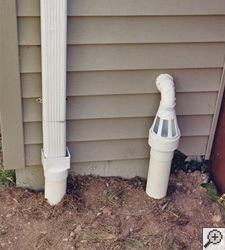 Some French drain systems are installed with a 1" gap at the edge of the floor. 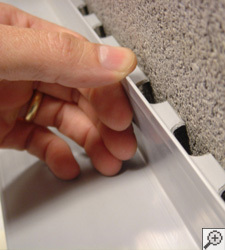 These gaps can collect dirt and debris from the floor, clogging your system. While other drains sit completely underneath the basement floor laying in the mud in front of the footing, underneath your home. 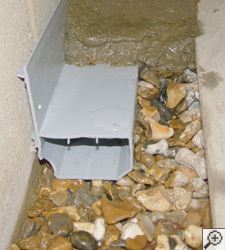 Mud can easily and quickly clog these drains causing the drainage system to stop working correctly. Residing outside of the home drains and discharge lines are liable to freeze during the cold winter months. You can become flooded if your discharge lines become frozen with ice, because water will be unable to exit, thus creating a backing up effect into your basement or crawlspace and could burn out your pump. A never-ending stream of water vapor and humidity entering the home can be caused by hollow cavities in block walls filled with water. 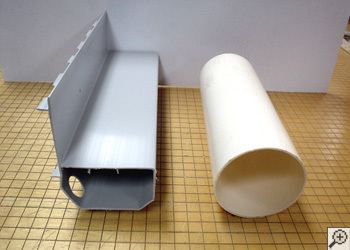 Basement Systems' WaterGuard® Ports are useful access ports to the system. 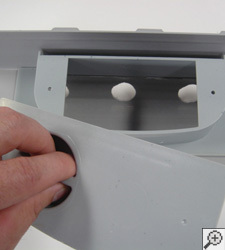 They have a knockout hole so you can drain a dehumidifier hose into the top of the system. They are also useful when inspecting or flood testing the system which will be important for any home in the Philadelphia. A monolithic foundation can be part of some home designs. With monolithic foundations, the floor and footing are poured together as one piece. This means the edges of your basement floor are indeed your footing and are very thick at the edges. A subfloor perimeter drainage system is not advisable, because jackhammering a trench at the edges of a monolithic foundation may damage the footing. 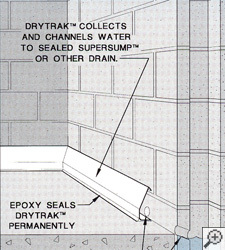 The solution for waterproofing a monolithic foundation is to install a baseboard drainage system on top of the floor. A special dovetail design and two-part epoxy ensures the DryTrak® won't separate or be accidentally kicked or knocked loose from the floor. Other drainage may also be recommended through the center areas of the floor, especially if you have leaking floor cracks in a monolithic foundation. Serving Pottstown, Trenton, Levittown, Newtown, Frenchtown, Red Hill, Doylestown, Bala Cynwyd, Quakertown, New Hope, Flemington and surrounding areas with a wide range of basement waterproofing services, BQ Basement Systems is the basement waterproofing contractor perfect for any home!